In this book, A Chimpanzee Tale, by Karen Young, Hoot, a chimpanzee, explains how happy chimpanzees live in the wild and why chimpanzees shouldn’t ever be in a city, zoo, movie, show, or circus. Hoot gives a lot of information about chimpanzees. Did you know that chimpanzees can’t swim? Or that they sleep in beds called “nests” that they make fresh each day? Also, did you know that they are our closest relatives? After you read A Chimpanzee Tale, you’ll know these very interesting facts and many more. This story gives you a good feeling, that you can do your part to change the world for chimpanzees who are in captivity, and it also talks about the sanctuaries that help chimpanzees. The pictures help to illustrate the story and make it fun to read. 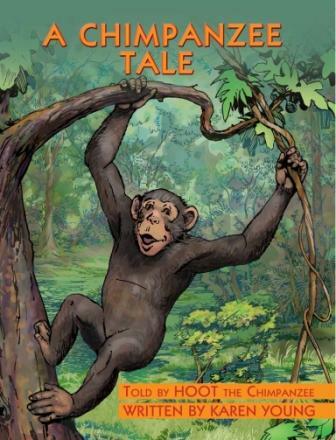 A Chimpanzee Tale is very different from other books. I love how the author, Karen Young, put important vocabulary words at the end of the book―that helped me understand the words much better. The afterword is also interesting because it seems as if the author is talking to the reader and explaining even more about chimpanzees. Reading this story was exciting, and it made me want to start a revolution for chimpanzees. * Kaitlyn Aiyana Enstice is the daughter of Tim Enstice, director of gift planning for PETA Foundation. As one of the sanctuaries mentioned in the book, we love this story which will help children understand the issues that captive chimpanzees face when used in appropriately as pets, entertainers, or research subjects. Karen Young tells the story in a poetic way and makes the point clear. Chimpanzees should be left in the wild with their chimpanzee families. And, when they have been used in captivity…sanctuaries work hard to help them restore some of their normal behaviors. Hoot tells how he and his friends like to be free and not in cages, which lets young children know there is an alternative to captive life. The author Karen Young has written the book in easy rhyming language which is great for reading out loud. The illustrations are also realistic. In addition, the reference areas are great-websites and sanctuaries to visit. Great review! I love how Kaitlyn gave us examples of the kind of facts we will learn if we read the book. I’m going to buy this book for my daughters!